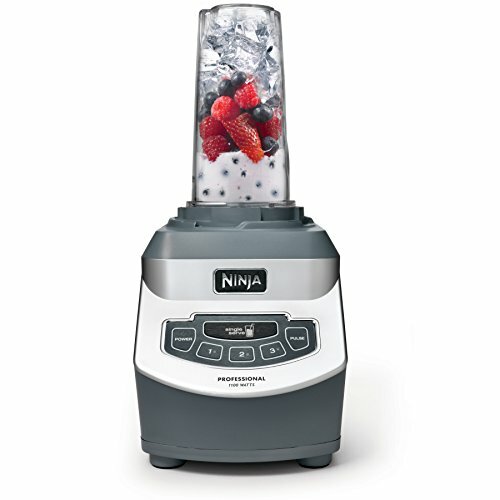 There are many Ninja blenders that are available on the market today. With all the models of the Ninja blender line looking and sounding similar, as well as offering similar features, we have a review to help you better understand which is the one that you should purchase. Ninja blenders are an answer to more expensive blenders that work insanely well, but that other people just cannot afford to buy. These blenders are meant to offer high quality and a large number of features for a significantly lower price. 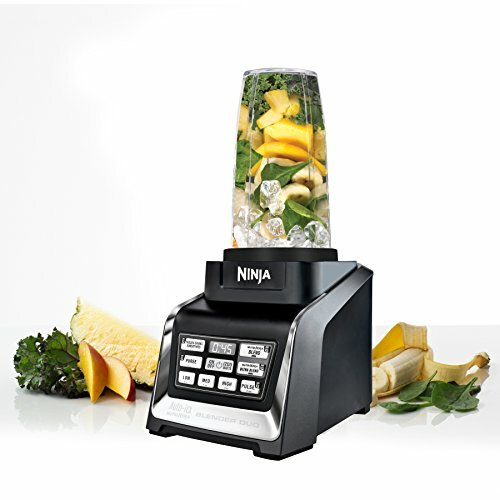 Blenders from Ninja are not only used for cutting fruit to make smoothies and shakes, they are also known to allow homeowners to make homemade sauces, soups, salsas, bakery items, peanut butter and more. When comparing Ninja blenders, or blenders in general, we take a look at the following qualities of a blender. Price is a great factor to consider first and foremost when looking for products to buy. If you have a set budget for which kind of blender you want, you can use it to help you narrow down your search. Ninja blenders, for the most part, are neither considered a fortune nor a bargain. They are priced in a moderate range, and you get generally favorable results for what you pay for. While you tend to pay more for a blender that does more, that is always not the case. The value you get for certain appliances depend on the brands that you compare. This review is focused exclusively on Ninja blenders, so comparing value is relatively easy and straightforward. In regards to how a blender performs, we are most focused on its speed and power. These two things are what determines if a blender can do its job quickly and effectively. A blender’s power should make it so that food is pulverized in the ways that you like it. This helps food contents before smoother and less chunky. Speed pertains to how fast the blender’s blades spin, although certain foods are mixed better when the blades move slower. All of these Ninja blenders have the capabilities of crushing ice and other hard objects, thanks to 1100 to 1500-watt motors inside. Any blender below 1000 watts of power will not be capable of doing such task. You would like to have your blender last for a handful of years before you need another new blender. It needs to take a long time and dozens upon dozens of uses before any signs of wear and tear are noticeable. Typically, the more a blender costs, the better quality materials that are used to create it. The motors inside Ninja Blenders are powerful, and with great power comes a lot of energy required in order to keep going. Motors with a lot of power tend to drain the life out of the blender faster than weaker motors, so things have to be included with blenders to help stabilize these motors. Thankfully, most of these Ninja blenders come with suction feet that stick to the surface that the blenders rest on. These feet keep the motor from shaking as violently, thus causing less power to be exhausted. A good blender also is not supposed to just look durable, but feel durable as well. If you hold the blender in your hands and it feels very flimsy, it may not be one that lasts very long. You would like a nine Ninja blender that feels like a very professional small appliance in your hands. Good blenders are supposed to come with many different helpful characteristics that make the blending experience easier for homeowners. For one, Ninja blenders come with automatic presets so that you can set a blender automatically depending on the type of food you want to blend. One example is ice cream. Good blenders also come with variable blending speeds. Blender blades are made to chop foods super fast, but setting the blades to slower speeds are also necessary to chop up other foods as well, or chop them up in a chunkier way. You will be better off buying a blender that gives you more options instead of less. All blenders have blades. Some come with two blades, and some contain as many as six. The number of blades inside of a blender does not translate to greater cutting or chopping power, but more blades can lead to a larger area to chop. If you pour a bucket load of fruit into the blender, for example, you would like the blender to blend all the fruit at once, rather than blend the fruit at the bottom, and have the fruit on top sink down into the container. Another feature that some blends have is the ability to crush or pulverize foods. This is most ideal for breaking down harder objects, such as ice, nuts, and seeds. Either a motor’s power can provide the necessary power to crush foods, or a special mechanism would be included. Another feature that can be useful to homeowners is the ability to single serve, without making too much for one person to enjoy. This is great for people who want only one serving, as they do not need to make excess in order to enjoy the beverages that they want to drink alone. Measurements are also important when it comes to select blenders for cooking. You would like to know exactly how many of a certain ingredient is inside the pitcher, and with easy-to-read measurements right in front, there’s no need to have to measure with a small measuring cup and pour a small amount in time after time. Most blenders come with recipe booklets that offer tutorials on how to use the blender better and how to mix ingredients in the process of making a recipe. The recipe booklet is meant to help homeowners utilize the blender to the best of their ability and explore all the different kinds of foods that can be blended. 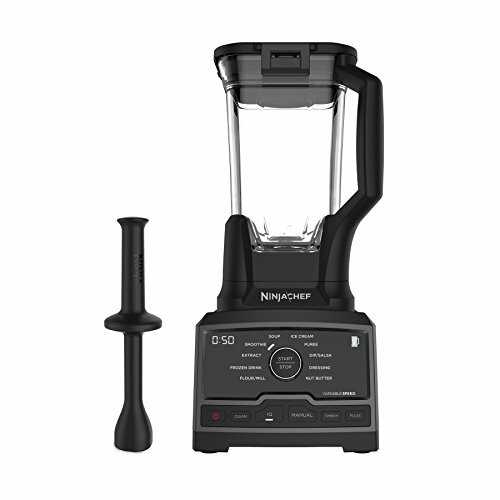 The Ninja blenders that we will review today are the CT805, CT810, CT815A, BL770, BL660 and the BL642. These are all some fascinating models that are universally acclaimed, but which is the one that you should buy? Read on further and find out. The CT805 is considered the flagship blender from Ninja, and come with various pre-sets for blending and/or liquefying foods. From frozen drinks to salsas, this is a great tool that skilled chefs and cooks can use, let alone homeowners that just want delicious smoothies. Ninja touts this as the highest-quality Ninja blender, as it is considered a great alternative to competing blenders that are considered premium and luxury blenders. You will be very pleased with this blender’s user interface. For each setting and option that you pick, the screen changes and the dial serves a different purpose depending on what modes and settings you choose. This eliminates the possibility of being confused with several different buttons. Like the legendary Vitamix, the Ninja incorporates a tamper. It’s one of the most useful tools in a blender that prevents you from opening the lid to push ingredients down into the blade. It’s commonly used for frozen foods like thick smoothies using frozen fruits and vegetables. There are 10 automatic presets that you can use from the blender’s control panel. When set to manual, the blades range from 7000 to 18000 rotations per minute, so you can blend foods into a paste, or just chop them into chunks for an easier method from just using your knife and cutting board. The CT805 also has a clean feature where the blender will clean itself. Add soap and water to its pitcher, and it will swish it around for a period of time. This spares you the trouble of having to clean the container out by yourself with a rag and your kitchen sink. Like the Vitamix, the CT805 uses a single blade with 4 fins. It makes is much easier to clean than the 2 blade designs seen on most Ninja blenders and it’s one less part to lose in your kitchen cabinet. This blender has feet that suction to surfaces, and this makes it harder for the blender to move as it is turned on. We all know what is possible when we turn the blender on and walk away. As long as the feet stay planted on your surface, the blender will never fall over or fall to your kitchen floor. The CT805 has a 1500-watt motor and a container that has a 72-ounce capacity. It can serve drinks for whole families with ease. The CT805 weighs a little bit over 10 pounds. The CT805 comes with a free recipe booklet with 50 recipes. Easily clean your pitcher at the touch of a button. Run the Clean Program with some hot water and dish soap after you are done with your recipe-its that easy. After what we have reviewed with the CT805, we have found no flaws or errors while using it. It is quite the machine, and then some, at the price point that it sells for. The CT810 is priced in between the CT805 and the CT815A. It retains the same look and features of the CT805, with its many different presets and beautiful user interface. This blenders has a 1500-watt motor and can carry 72 ounces. All the automatic presents are there, and the blades are still capable of chopping up food wonderfully. Like the CT805, this blender also has an automatic cleaning feature and feet that stick to the surface that it is standing on. The only differences between the CT810 and the CT805 is that the CT810 comes with a tumbler and a recipe booklet with fewer recipes. That’s it. The blender is essentially the same one as the CT815, but it just has a different number. We are not even sure why the CT810 is heavier at 13.5 pounds. The CT815A is like the CT805 and CT810 in many different ways. It offers various automatic presets, many different blade speeds, a modern digital screen, and the quality and durability that comes with the CT805. It features a 1500-watt motor, a 72-ounce pitcher, and blades that can spin as fast as 18000 RPM. But at 14 pounds, this is a very heavy appliance, and we are not sure what changes are present that constitute a few extra pounds. The user interface performs in almost the exact same manner as the one found on the CT805. There are virtually no changes in options or appearance to be found. This is not a complaint, however, but something worth pointing out. The CT815A can also clean itself when you add water and soap and set it to “clean”, and it also has suctioned feet that makes it not move when it blends. The only difference between the CT815A and the CT810 is that the CT815A comes with “Smart Vessel Recognition”. When you attach the tumbler, the blender will automatically set itself to a particular blending mode. This is a neat feature to save time, but we are not quite sure what other attachments can work with it, or even how this feature constitutes a model of its own. The only upgrade the CT810 has from the CT805 is the tumbler, and the only upgrade the CT815A has from the CT810 is the ability to recognize it. These three blenders are all basically the same, though. Why make the same blender three times, name them differently, and give them one small addition to hike up their prices? Perhaps the CT815A also offers better performance or more advanced technology, but there is really not much wrong with the CT805 in order to consider a model with a small new feature an entirely new version. You would be better off just buying the CT805 for less money. 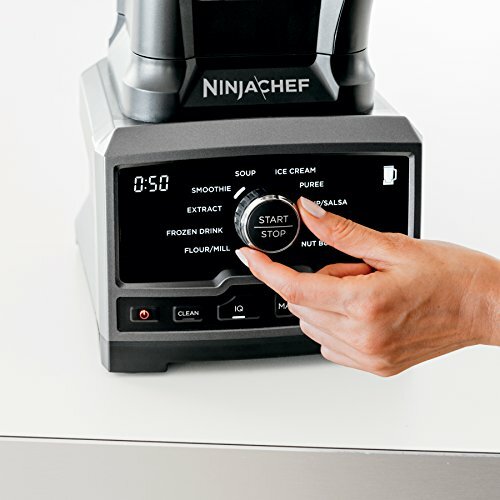 The BL770 is considered the best Full-Size Ninja blender, it is simpler than the high-end Ninja models, but that also means easier to use, in regards to choosing manual speeds. This is a lightweight blender that weighs just nine pounds. This blender comes with a food processor bowl that has a capacity of eight cups. It is ideal for creating dough in less than a minute. The main pitcher has a 72-ounce capacity and a 1500-watt motor. This blender has suctioned feet so that it will not move when its motor is running. 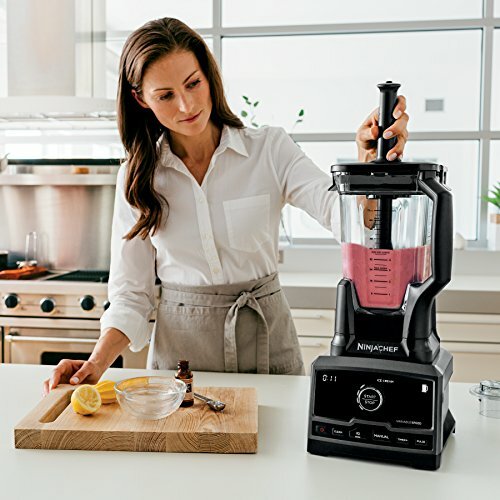 As many blenders are known to shake or move when they blend foods, this blender’s feet will stay firmly planted on a hard countertop or another surface. There are not any automatic presets like the CT805, but rather three different actions: Blending, mixing (as in batter and other bakery) and crushing. Unlike the other high-end blenders, this comes with a single serve option. With that in mind, you can use this blender to help you bake cakes, cookies and other doughy goods. The mixing in the blender is done very well, and there is no need to add in ingredients halfway through the process. The crushing feature allows you to create goods like salsas, dips, sauces and more. It is capable of making most foods like the other high-end blenders, but just in different ways. There are 30 recipes inside its included booklet. There is no dial to set the blender to “soup” if you want to make soup, so this requires more trial and error to help you achieve your desired results. Dishwasher-safe and BPA-free parts..Includes one 1500-watt base, A food processor bowl, 72 oz. Total crushing pitcher, two 16 oz. Nutri Ninja cups with to-go lids, and a 30-Recipe inspiration guide. Furthermore, there are only three speed settings. While the range of speeds is fairly decent, there is no indication for which speeds are best for what kinds of foods. You will have to once again do a trial and error, and take a note of the speed you need to use to blend a certain food the way that you like it. The BL660 is touted by Ninja as the best 2-in-1 blender for smoothies and healthy drinks. It has the most blades of all the Ninja models, six, and a smaller 1100-watt motor. In many ways, it is very similar to the BL770. This blender weighs about ten pounds,and is one of the least expensive blenders made by Ninja. This blender comes with a pulse feature, which allows the food some time to sink down before blending resumes, this makes sure that the majority of the mix does not hover in between the blades and no cuts or chunks are too large. Its crushing capabilities allow you to still enjoy some nutrients and vitamins found in fruits. 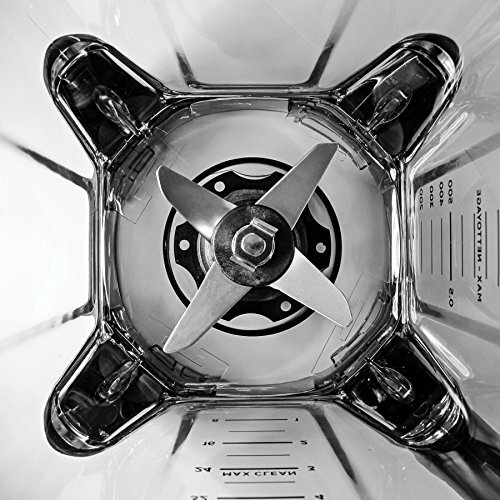 Like the BL770, the BL660 has three speed options and a single-serve feature. It is capable of even crushing small, hard ingredients like seeds and nuts, so homemade peanut butter is also a possibility. Included with the BL660 are two drinking cups, primarily for your delicious smoothies. Unlike the other blenders, this one does not comes with a recipe booklet. This is rather disappointing, as recipes are necessary to show you how to use the blender and what kinds of foods you can prepare. A possible problem with this blender is its six blades. They are placed in different areas of the pitcher, and this can be tricky when trying to put larger items inside of it. Ice cubes are one example. While this can be a good thing to some homeowners, it may turn off others who want a blender that is easier to handle. The BL642 is another great blender to consider. It may not have any digital screens or modern dials, but it does come with a series of buttons for various presents and other settings. Many of these setting feature “auto-IQ”, which is a combination of time and pulse for just the right blends for the foods that you want to make. There is “blend”, “ultra blend”, “puree”, and “fruit drinks/smoothies”. While not like newer models, this still offers a few easy options for homeowners. There are also basic blending speeds of “high”, “med” and “low”. The BL642 contains a 1500-watt motor and a 72-ounce pitcher. It weighs in at 10.1 pounds. This blender also comes with three different drinking cups, all in different sizes and with lids. Also included is a booklet with 75 recipes. Compared to other blenders with 1500 watts, this is extremely loud. If not for its suctioned feet that does not allow it to move while blending, we would suggest to place a towel underneath it. If you place this blender on a towel, it will still move, as its feet have nothing stable to grasp. Our pick for the best Ninja full-size Ninja blender in 2018 is the Ninja CT805. The CT805 simply has a load of features to offer to homeowners that want to blend fruits, cooking ingredients or anything else. Whatever you wish to make, you can so with with ease and simplicity. If you know what you want to blend, you will quickly know what to do. Homeowners will easily enjoy using this blender. 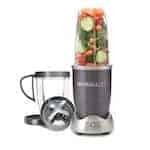 If you are not too keen on using a digital screen and wish to stick to buttons you will not be disappointed when you eventually do decide to purchase a blender such as this. This is the best value you can get on a blender. With great quality, many ways to blend, and a future proof design, you get a lot for what you pay for when it comes to the CT805. Do not bother with the CT810 or CT815A, unless those extras that they come with intrigue you.